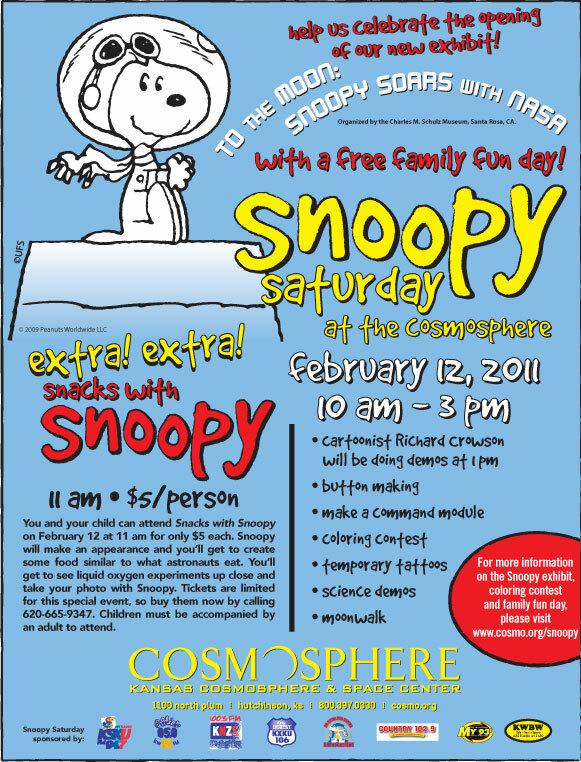 Join the Cosmosphere February 12 for Snoopy Saturday! It's the official opening of the exhibit, "To the Moon: Snoopy Soars with NASA." From 10-3 enjoy a host of free activities, including making buttons, straw rockets and more. All free to the public. At 1 p.m. cartoonist Richard Crowson will speak and do some cartooning demos. That's free to the public. An extra event is Snacks with Snoopy at 11 a.m. Tickets are only $5 for that - make food similar to what astronauts eat, pose for a photo with Snoopy and see what liquid oxygen can do to an apple. Call 620-665-9347 for your ticket.